The Book of Exalted Darkness is two things: a holy decopunk campaign setting (think Rocketeer or Sky Captain and the World of Tomorrow) and a sourcebook for playing evil characters in D&D 5E. Together they make for a slick and stylish campaign setting with a bevy of meritorious NPCs paired alongside a grimoire of vile and forbidden evil, the PCs gaining a little more edge through their trickery or perversion of the very technology that makes the world so unjust. Choose your adventurer's Inherent Heresy, devise how best to destroy the 9 spheres of the Celestial Heroes, and embody the very essence of wickedness as you strike at the heart of the world's immortal rulers greatest works, taking all of they've built as your own or tumbling it all to destruction! Download these free PDFs to preview the project! Wondering where the "goodness" is at? Check out the Book of Celestial Heroes update and the Exemplar class playtest! All pledges of $100 or above receive a PDF and at-cost print voucher for Book of Celestial Heroes included with their rewards. This is my team's fifth Kickstarter-funded campaign setting and you can check out previews for the last two here and here. These are my print proofs for each previous campaign setting (the covers for 2099 Wasteland and Mists of Akuma wrap entirely around and only look like this in the two books you see here). When we finished the 2099 Wasteland Kickstarter (ahead of schedule and bigger than expected! :D) I said to myself, "that's enough Mike, stay focused," and began to layout a Shadow of the Demon Lord conversion for Mists of Akuma. But something in the back of my head wouldn't stop whispering and there was no escaping the evil, forbidden voice. It followed me day and night, hounding at me, nipping at the heels of my mind. I did my best to ignore it until it utterly refused to accept that conclusion. But Miiike. Inaequa is the answer, Mike. Inaequa. Inaequa is what really makes the Book of Exalted Darkness work. When we initially started this project (over a year ago) the idea was a standard medieval world. Middle-Earth where the angels have won! But what's the real appeal of that? Where's the real bite, the hook? Then came the idea to make the world decopunk. Nothing pairs better with angelic and celestial aesthetic than The Rocketeer and Sky Captain and the World of Tomorrow, and it brought a little bit of really appealing pulpy feel. A wonderful combination! But still something was missing—a linchpin that really makes all these concepts fit together. That's inaequa. Don't get me wrong—playing an evil PC can be entertaining and rewarding in itself—but for a whole campaign? For an entire group to play despicable characters weeks on end? That's not always easy for everyone to be intrigued by and can prove difficult to keep banded together. But what if there was something fundamentally wrong with the supreme goodness that has blessed the world? That's where inaequa comes in. Inaequa powers the marvels and wonders of technology in the decopunk world of Askis, but it also gives off radiation that lengthens the lifespan of good creatures. Inherently inaequa is not evil, nor are its effects—it favors one morality over another but even so there's nothing fundamentally wrong with it and YET, and YET! That's a complex package worth unfolding! Like my other campaign settings there are new thematic attributes that play very heavily into the central element of inaequa that allow PCs to trick devices powered by the resource or otherwise manipulate them, overcharging an inaequa jetpack for a brief burst of speed before burning out or setting off an inaequa gun to explode like a grenade. With this final major reagent in the maddened minds of the design team, the utopian world and the paths evil adventurers will pursue to bring balance back to Askis (or an evil imbalance!) poured out in a frenzied torrent of truly wicked game design. But what exactly is in this 180 page full color hardcover book? THE HOLY DECOPUNK UTOPIA OF ASKIS and its three continents: contiguous Ouranios, Samovi, and Zakuthombo. THE 9 SPHERES OF ASKIS, great workings of the Celestial Heroes that rule over the world. By subverting or upending these essential pillars of civilization the PCs will either bring society down around them or rise to rule over the world! 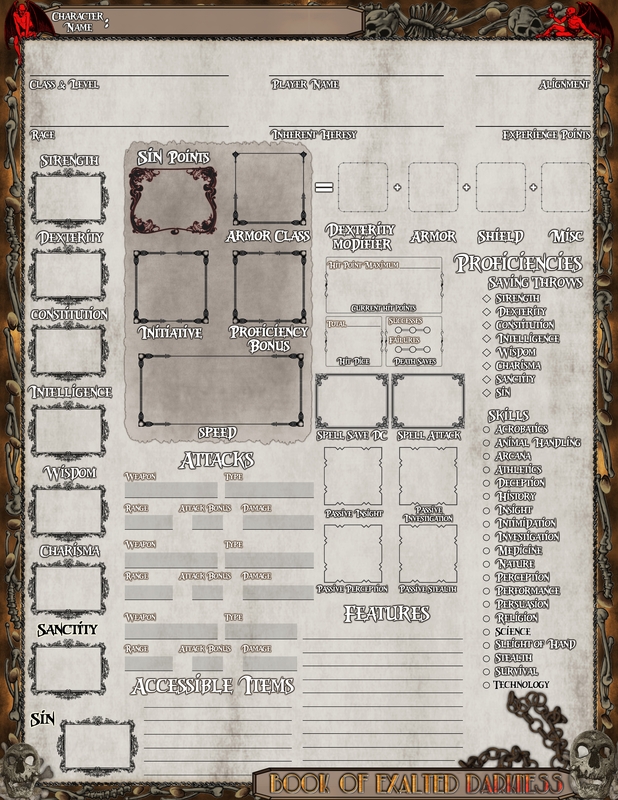 DOZENS OF NPCs throughout the establishment of Askis' government as well as the 20th level Celestial Heroes themselves (a tiefling sorcerer, dwarven cleric, half-orc fighter, aasimar paladin, half-elf bard, elven wizard, gnome ranger, halfling rogue, and human monk). As the evil adventurers go about destroying or mastering the 9 spheres of the world, these legends will be their staunchest opposition and most difficult assassination targets! TWO NEW ABILITY SCORES (Sanctity and Sin) AND SIN POINTS to give evil adventurers an edge! INHERENT HERESIES that all despicable PCs in Askis gain at character creation: anger, envy, gluttony, greed, lust, pride, or sloth (and whatever other vile ideas playtesters offer up, like mendacity). EVIL CHARACTER BACKGROUNDS to play a "reformed" murderer, disloyal traitor, unholy witness, and more! THREE CLASSES: the demon or devil summoning Diabolist, lunatics that transform themselves into monsters via the paths of the Occultist, and of course Mad Scientists! NEW CLASS ARCHETYPES FOR EVERY CLASS! Fearmonger sorcerers, abyssal and infernal clerics, feral barbarians, dark chi monks, and many more! DARK TRANSFORMATION PRESTIGE CLASSES! D&D 5E hasn't offered any of these yet and we're very excited to see how they work in a larger playtest so that we can craft solid rules for becoming a dark one, fiend, kyton, ooze, rakshasa, protolich, or even one of the nearly extinct chromatic dragons! THE EVIL MAGIC TRADITION, an entire school of magic dedicated to being vile with more than two dozen spells including blood spear, bone spurs, cerebral hemorrhage, flay skin, sanguine razorstorm, and whatever else playtesters feel the book needs! VILE AFFLICTIONS because what's a book about evil without some new diseases and poisons?! EXPANDED FEAR RULES for GMs that want to include more terror in their games! FORBIDDEN MAGIC ITEMS by JAMES INTROCASO, VILE AFFLICTIONS, EXPANDED FEAR RULES, NEW MONSTERS BOTH GOOD AND EVIL, GAMEMASTERING TIPS FOR EVIL GAMES and MUCH MORE! Many pledge levels include at-cost print vouchers: your Kickstarter pledge pays for the PDF and when the book is done, you can get a physical copy for the cost of the ink, paper, glue, and shipping (estimated cost for 180 page hardcover prints: $13.29 or £9.50; shipping varies by location). I have done Kickstarters with direct print rewards but my experience has been that a far better, bigger book can be produced with the flexibility offered by print vouchers (Hypercorps 2099 was not done by voucher and only 20% larger than promised whereas Veranthea Codex doubled in size and both Mists of Akuma and 2099 Wasteland delivered at 50% larger than anticipated). Book of Celestial Heroes UNLOCKED! For every bit iniquitous, nefarious, and wicked the Book of Exalted Darkness is, the Book of Celestial Heroes is just as illuminating, redeeming, and uplifting. Etch out your heroes’ place in history by protecting the divine gifts blessing the world, achieving a true utopia for the rest of time! More information about this UNLOCKED add-on and new pledge reward can be found here. 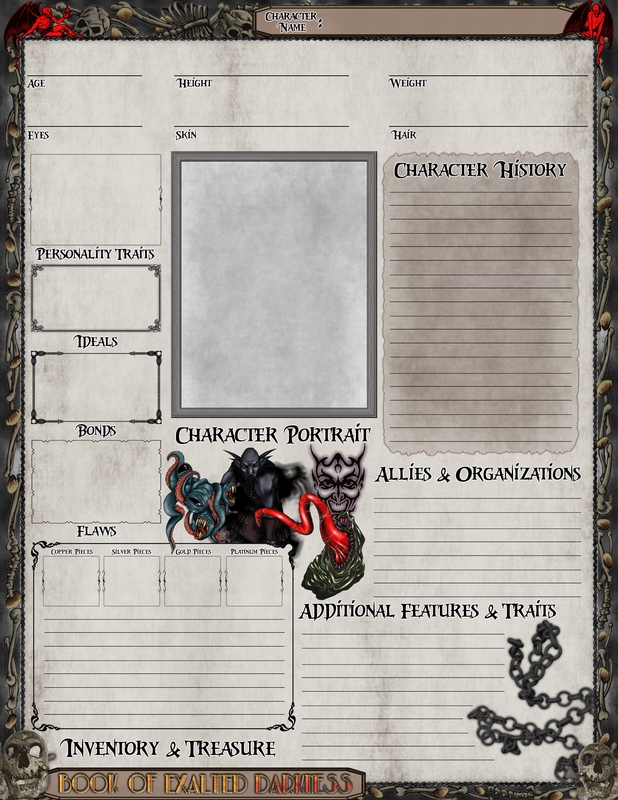 STRETCH GOAL #1 - UNLOCKED: Mists of Akuma is my first conversion to the Shadow of the Demon Lord RPG but I want to take the Book of Exalted Darkness to it as well! When we reach 150 backers or $5,500 (whichever happens first!) this will be available as an add-on for either a PDF, a print voucher, or both! STRETCH GOAL #2 - FIENDISH LORDS: When we reach $6,000 or 165 backers, a new section will be added to both the Book of Exalted Darkness and the Book of Celestial Heroes--demon lords from the Abyss and the devils of Hell! As villains you might ally yourself with or gain boons from these despicable fiends, and as a holy hero you'll be able to take the fight to them! $5 - VTT Map Pack: High-resolution digital maps for every map that appears in The Book of Exalted Darkness. $15 - Book of Celestial Heroes PDF for do-gooders in Askis! $20 - Book of Celestial Heroes Print Voucher for exemplary adventurers that want a tome in their hands! $20 - Extra Print Vouchers (6): Are you the owner of a Friendly Local Game Store? We want to support you! For every extra $20 you pledge you'll receive six (6) more print vouchers that should allow you to maintain a reasonable mark-up for selling the Book of Exalted Darkness in your store. Make sure to let your FLGS know about this add-on! $30 - Book of Celestial Heroes PDF and Print Voucher for the truly devout do-gooder that wants something digital and in their gaming bag! $100 - Online Mini-Campaign: Mike Myler will design and run a small campaign using the Book of Exalted Darkness and Roll20.net for you and up to five friends! This will be a minimum of 5 sessions played at the discretion of Mike Myler's existing schedule for Kickstarter games (Sundays are booked through late summer 2017 with Mists of Akuma and 2099 Wasteland sessions). All backers that have pledged for a PDF or print voucher of Book of Exalted Darkness gain access to the playtest google document as soon as the project's funding period ends or when we reach $10,000 of pledges (whichever comes first). Book of Exalted Darkness is the work of the same design team behind Hypercorps 2099 and Mists of Akuma—myself (Mike Myler), Michael McCarthy, Luis Loza, and Savannah Broadway—with one exception: James Introcaso is on board for magic items. For illustrations however we are devoting all of our art budget (about half of the funding goal) to giving one person (the ridiculously talented Indi Martin) money to conjure more pieces like the covers of the free PDFs above. Other than that (barring potential new designers and artists from stretch goals) that's it because I do my own cartography, graphics, and layout. While there's undeniable value from the input and perspective a larger team brings to a book, the more hands that are in the pot the longer it takes to get material finished—often not even due to negligence but a statistical increase to the chances of people suffering emergencies (not to mention more time spent communicating instead of just getting the work done!) and the more difficult it can become to keep a strong vision of the project in place. These are my A-Team and this is our next mission: we know one another well, work together seamlessly, and are tried and proven to produce amazing things! Please consider backing this project! Thanks! Folks on the internet have asked for more information about the campaign setting itself and I don't want to leave anyone disappointed (see Risks and Challenges below) so I'm compiling the juiciest reveals from project updates here. But first let's dig into the big overlaying structure behind the world: the 9 Spheres of Askis. Long ago the world's "heroes"--three adventuring parties known as Tucker the Great & Co., The Order of the Shining Stone, and The Golden Redeemers--smote all of Askis' evils, beating back corruption and nearly purging it from the planet. Each of the nine Celestial Heroes is responsible for maintaining a ward against malevolence, keeping it at bay through a variety of both mundane and magical means. Obviously the Book of Exalted Darkness has a ton of awesome evil player options (see the bullet list above!) inside of it, but these classically typed NPCs are at the apex of what the PCs must accomplish in order to bring balance back to the unjust world--starting with the spheres. Each update (after the first, anyway, but that's alright because Inaequa gets a lot of love up there) will include information about one of these key features of Askis so stay tuned and keep an eye on the update tab! Sphere of Askis - Bloodsong Storms: The half-elf bard Mystral Farsong is responsible for a powerful and encompassing ballad that floats quietly just above the waters of Askis' oceans and seas, a sub rosa melody that reverberates along the waves of the world in search of only one thing: the freshly-spilled blood of humanoids. While this is a powerful enchantment and not to be underestimated, the vast distance it must cover makes this great celestial work a tertiary sphere--PCs might be able to undo it by 12th level or if they are particularly clever, maybe as low as 10th. Evil hearts that persist in the utopia of Askis do so either underground, with the aid of technology or magic to hide their wickedness, inside reform institutions (undergoing brainwashing to become good), or on the high seas living a life of piracy! The Bloodsong Storms detects when a nefarious seafarer is nearby (sensing an aura of evil) and blood spills onto the water, causing the global enchantment to begin conjuring a small storm in the nearby area. The more flowing crimson and malevolence there is, the worse the storm gets until reaching a true tempest--the sort of thing any naval ship is likely to see, report, and respond to! Like all of the Celestial Heroes' great works the powerful melody requires attention and care to be maintained. Mystral is the only person on the planet able to perform the daily tasks that keep the Bloodsong Storm strong, though the details of her rites and what the PCs need to do to destroy her creation will appear in the Book of Exalted Darkness. Sphere of Askis - Chime of Contests: All of the Celestial Heroes are capable of incredible feats and possess great prowess, but that does not mean they are all geniuses. Grukk the Axe is, as his name would suggest, not terribly sophisticated or nuanced. As his companions went about constructing their great works--Tucker negotiating with the powers of heaven itself for access to inaequa, Mystral composing her elegant Bloodsong Storms--the half-orc searched through Trucker the Great and Co.’s treasure hoard, seeking out the most valuable metals and gems he could find. The fighter took them into the rim of the Herculane Volcano, forging a huge cymbal made from adamantine, mithral, and jewels fused together by the heat of the planet and the strength of Grukk’s soul: the Chime of Contests. Since then his fellow Celestial Heroes (the dwarven cleric Gimli Stoneflask, the tiefling sorcerer Damien Ventrelli, and the elven wizard Rankir Tarryndorn) have used their magics to enchant Grukk’s creation, turning it into a proper artifact capable of sensing the entirety of the world and connecting the souls of those who have pledged themselves to the half-orc’s crusade for honor. To become a part of this revered order is the lifelong ambition of many a young warrior though few prove able, falling in the final test for admission--holding their own in battle with Grukk for a full minute. Any that succeed (whether by guile or prowess) are brought into the fold, attuning themselves to the Chime of Contests and roaming the lands of Askis in search of its telltale ringing. When a sentient (Intelligence of 3 or higher) creature fights dishonorably (by ambushing a target without challenging them first, using dirty tactics, striking a helpless opponent, or utilizes other dastardly tactics at the discretion of the GM) any Knife of the Chime within a certain range hears a telltale ringing from that general direction. These warriors are honor-bound to investigate any instances they are able to and this inevitably draws attention to evil afoot in Askis, whether they are able to stop it immediately or are left to deduce what has happened from whatever remains from a despicable combat. While evil isn't at all common on Askis, it is a little easier to find under Askis. Mad scientists are the only lot of iniquity that have managed to collectively elude and resist the Celestial Heroes' purges, staying one step ahead of their oppressors at every turn. It is through these insane geniuses (which is one of the 3 classes in the book!) that parties of evil adventurers are gathered together and directed, used as pawns in long and elaborate plans--until the players turn the tables when the opportunity presents itself, of course, as any nefarious-minded group of wicked villains will eventually do at one time or another. The first of these deranged inventors, Gespadrieux (pictured above) appears in the Killing the Golden Twins adventure module but more will be included throughout the Book of Exalted Darkness. This is my 6th Kickstarter project and we completed the last one (2099 Wasteland) not only ahead of schedule but also at 50% larger than the anticipated page count. I'm very good at my job (making RPG books, something I have been doing full-time for 5 years) and will go absolutely out of my way to make sure that each and every backer, whether pledging big or small, is 100% (or more!) satisfied with backing this Kickstarter.